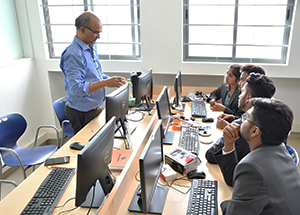 This technology-intensive, application-focussed programme enables learners to draw from a broad range of Information Technologies (IT), including computer hardware, networking, operating systems, programming, web development, database, scripting, IT security, IOT, etc. The programme incorporates domains such as security, internet and mobile banking systems, software development, risk management, advanced cyber forensics, knowledge management, Data Analytics, Artificial Intelligence, financial technologies and biometric security, etc. A graduate of this program would be equipped to pursue a career as an IT Engineer, Network Engineer, or as a Scripting and Debugging specialist. The lab is equipped with 27 systems of which 3 systems areconfigured with Windows 10.0 and the rest loaded with Ubuntu operating system. It is mainly used to teach programming using python for project based course like “Programming with Python”. The objective of the lab is to make students choose libraries of available components, and to use these for building their own software. The lab has 25 systems all of which are configured to boot either Windows 10.0 or Ubuntu operating system. It is mainly used for programming using C, C++, Java, python, Mobile Application development using Android Studio etc. This lab is also used by students to develop and implement their mini projects. Here, students acquire skills to solve computing problems useful in real-world. The lab has 22 systems, of which 10 are configured with Windows 10.0 and the rest with Ubuntu operating system. This lab is used to support programming using C, C++, Java, python, Mobile Application development using Android Studio etc. 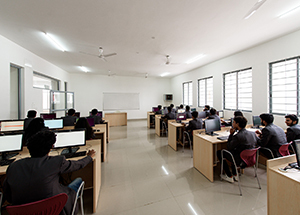 The major objective of this lab is to teach problem analysis and design of algorithms. The solution provided must also be optimum i.e., time complexity and space complexity of the solution shall be minimized. The lab has 22 systems that are configured with Ubuntu operating system. It is used for programming with Java for courses like object oriented programming, programming with Java etc. 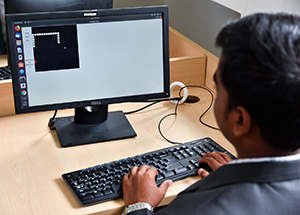 Students trained in this lab are able to apply object-oriented concepts to developsoftware applications. Students are taught to design, using good design principles with consideration for software reuse and maintainability. The lab has 22 systems allconfigured with Ubuntu operating system. It is mainly used for developing database applications using MYSQL. The major objective of this lab is to provide a strong formal foundation in database concepts, technology and practice to the participants to groom them into proficient database application developers. The overriding concern, therefore, is to include just enough concepts and theory to motivate and enrich the practical component, and to include technology component to maximize the relevance of the course to the industry without sacrificing the long-term objectives of rigor and foundational strength that can withstand the vagaries of technological advances.